Yuh-chieh Lin and Iek-Heng Chu are proud co-authors of a recent article published in Advanced Energy Materials on KVOPO4, a novel, high capacity multi-electron cathode for Na-ion batteries. 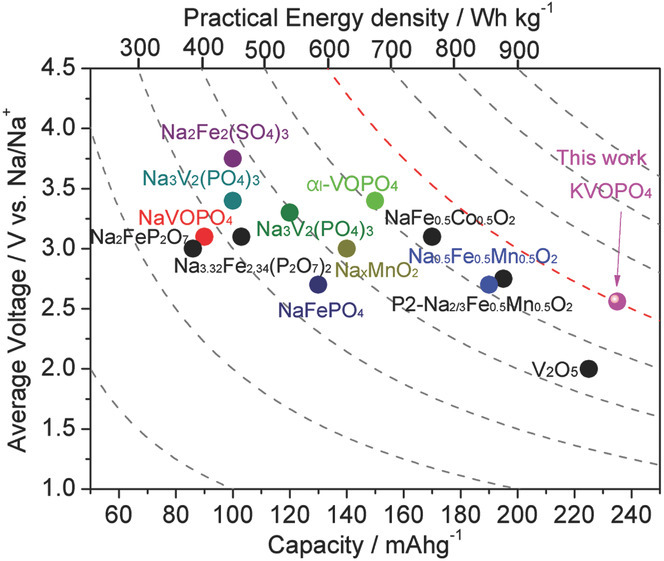 This highly collaborative work, which is part of the NorthEast Center for Chemical Energy Storage (NECCESS) demonstrates fully activated Na+ intercalation over the V3+/4+/5+ couple in a vanadyl phosphate phase for the first time, with a high practical energy density of over 600 Wh/kg, the highest yet reported for any sodium cathode material. DFT calculations (contribution from MAVRL) shows that KVOPO4 is a 3D ionic conductor with low Na+ migration energy barrier of <450 meV.